According to a recent news article from CBS Boston, a middle school teacher in Charlton, was recently killed in a bike crash. This victim was 40-years-old at the time of this death. A Massachusetts State Police (MSP) spokesperson said the accident occurred on Route 20 at 3:30 p.m. The cyclist was riding on a side street when he attempted to cross the highway. He was hit by a 1997 Audi sedan as he was attempting to cross the highway. The driver immediately came to a stop and waited for MSP to arrive on scene. He is cooperating with authorities in their Boston area bike crash investigation. The investigation is ongoing and the driver has need not been charged with any crime or cited for any moving violations as of the time of this article. The bike crash victim was reportedly a well-respected educator and many members of the community are in shock and will continue to mourn his loss. Causation and fault are still being investigated. 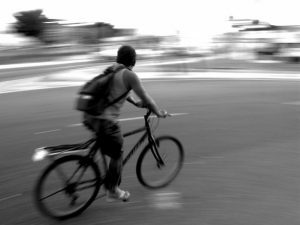 When a rider is on a bicycle, there is very little protection from an impact by another vehicle. This however does not mean the plaintiff will be blamed for choosing to ride a vehicle that does not provide the level of protection of the average passenger sedan. Pursuant to Massachusetts General Laws (M.G.L.) Chapter 85, Section llB, a bike rider may ride his or her bicycle on any bike way, public road, or street in the Commonwealth so long as it not marked as a restricted highway for motorized vehicle use only. For example, a cyclist is not allowed to ride on the Massachusetts Turnpike but he or she can ride on most local roads and streets, include non-limited access highways. A high is called a limited access highway because it has on ramps and off ramps and there are the only limited access points as opposed to Route 9 which is also a highway but it has side streets and can be legally accessed or exited from just about anywhere. When a person is riding a bike on the streets or a highway on which they are legally allowed, they must follow the same traffic regulations as a car, but they are also given the same rights as anyone else on the the road including those in car. This means that bike rider must follow the rules and stop and red traffic singles. When a bike rider chooses to run red lights and blow though through stop signs, they are also engaging in negligent conduct which may serve as bar to recovery, but contrary to popular belief, the vast majority of bike riders do follow the rules and are often the victims of at-fault motorists who do not follow the same rules. This is important under the concept of comparative negligence in the Commonwealth. Pursuant to M.G.L Chapter 231, Section 86, we have a comparative negligence system and contributory negligence has a limited effect. Under the old common law system, handed down from the British, if a plaintiff was even one percent negligent in connection with an accident that resulted in a personal injury to the plaintiff, this would serve as a complete bar to recovery. This was known as a pure contributory negligence system and is still the law in a handful of states. However, even in those states, there is a way to get around that with what is known as the last clear chance doctrine. Even if a plaintiff was contributorily negligent, he or she could still file a valid personal injury claim and win if it could be shown that the defendant had the last clear chance to avoid the accident. Under the current system in the Commonwealth, the plaintiff can still recovery even if he or she was negligent in connection with the accident, but was less than the negligence of the defendant. For example, if plaintiff was 10 percent negligent, and defendant was 90 percent negligent, plaintiff can win this case, but whatever the jury determines to the be the appropriate damages award will be decreased by the amount of the plaintiff’s negligence. In this example, if plaintiff was awarded $10,000, plaintiff would only receive $9,000. The limitation to this comparative negligence system is in cases where plaintiff was more negligent than then defendant. If the plaintiff was determined to be 51 percent negligent, and jury makes such a determination, this would serve as a complete bar to recovery. However, most cases will settle prior to trial so if a plaintiff was possibly more negligent than a defendant, but a defendant’s insurance company settles the case, the comparative negligent system will no longer be relevant. In the city of Boston, statistics are kept regarding the number of bike crashes along with a lot of information about the types of crashes and crash victims. The accidents are even classified according to age of the victims. For example, the age group most often involved in bike crashes is riders between the age of 23 and 35. While this does reflect the greater number of riders who fit into that age group, as biking becomes more popular for both recreation and as a means of commuting to work, it would not be surprising to see a shift in the numbers so the results are more balanced between riders of many different age groups.